In conjunction with Eclipse’s Europa release BIRT 2.2 is now available. This release represents a significant improvement in features and functionality, including over 200 enhancements. 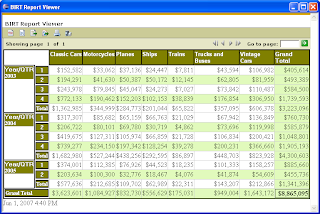 Some of the more significant features include a new Cross Table element, that when constructed with the new data cubes technology allows the creation of dynamic tables with support for column and row aggregation, new emitters for XLS, PPT, DOC, and postscript formats, a new web service data access driver, improved charting with the addition of six new chart types, new web deployment wizards, and tag libraries for the BIRT web viewer and charting engine. here and is an example of using the new BIRT Cube technology in conjunction with the new Cross Table Element. In previous versions of BIRT cross tables could be created, but the number of vertical columns had to be known beforehand. This is no longer necessary, as this example illustrates. Be sure to download the latest Release Candidate of BIRT and give the new features a try.